First dish made was massur dhal, made in about 10 mins, 3 mins once cooker whistles, the other mins were used sauteing the onions, garlic, panch poran etc. Perfect texture! Your cooker looks good, if tiny, but obviously handy for small amounts. Tip: Burnt dried red chillis are the secret of a Smokey Tarka Dhal taste. Hi Chewy, thanks for the tip. 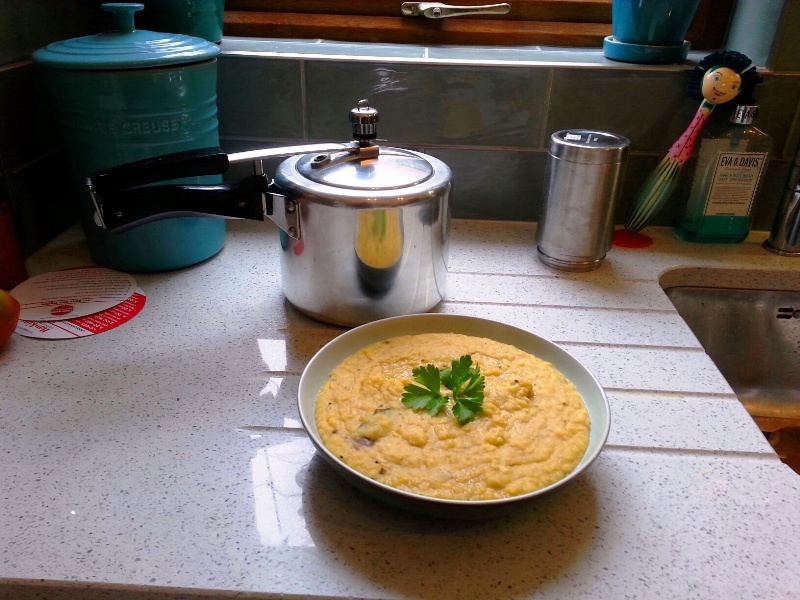 The cooker is ideal for just the two of us at 3 litres and the texture of the dhal was lovely and creamy although it was setting by the time i took the photo. I usually water it down when ready to re heat it so that it is runnier. Brown Cardamoms seem to have have a smokey element to them, it may be worth experimenting with a few.